When it comes to fire tinder and fire starting materials, I could probably write a book on all of the different natural and store bought materials I have used – some working better than others. However, for the purpose of this post I am going to focus on what I think is the most effective and economical home-made fire tinder/starter available. 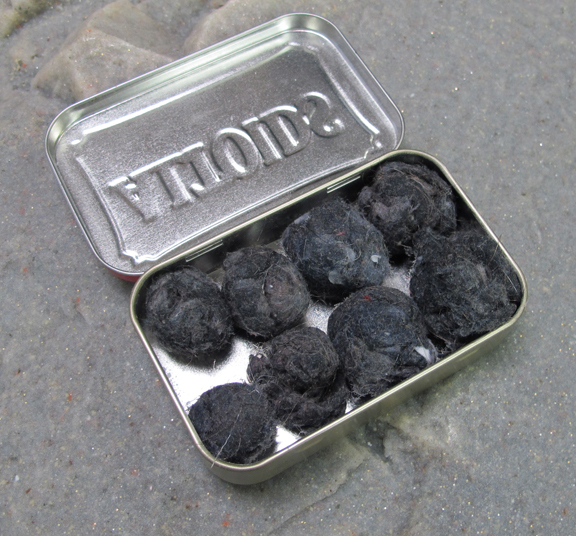 Here at Willow Haven Outdoor, we call these very cheap & very effective fire starters PET Balls. This stands for Petroleum Balls. 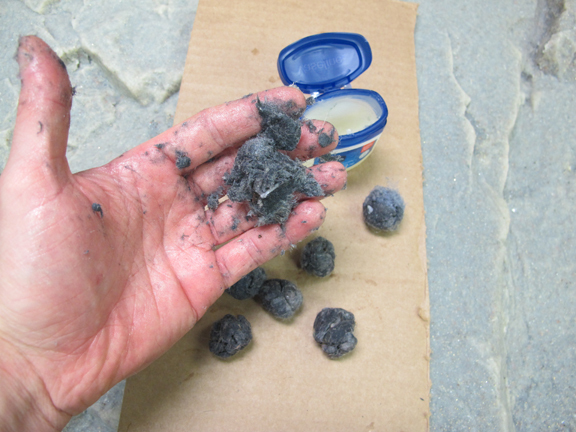 Put simply, a PET Ball is a wad of dryer lint saturated with petroleum jelly. In my experience, a PET Ball will successfully take a spark from almost any ignition device (flint & steel, fire steel, match, lighter, friction coal, etc…) even in horrible conditions. These are hands down my # 1 recommended carry for fire tinder/starter material – even above anything you can spend your hard earned money on at a store. I keep a container of PET Balls in both my Bug Out Bag and also my excursion pack. They are SIMPLE & CHEAP (REALLY CHEAP) to make. Below is the process. The first ingredient is completely FREE and abundantly available – Dryer Lint. Dryer lint is the perfect consistency to use as a fire tinder material. It’s fluffy, fibrous and highly flammable. This, combined with run-of-the-mill Petroleum Jelly, makes for an incredible fire starter combination. 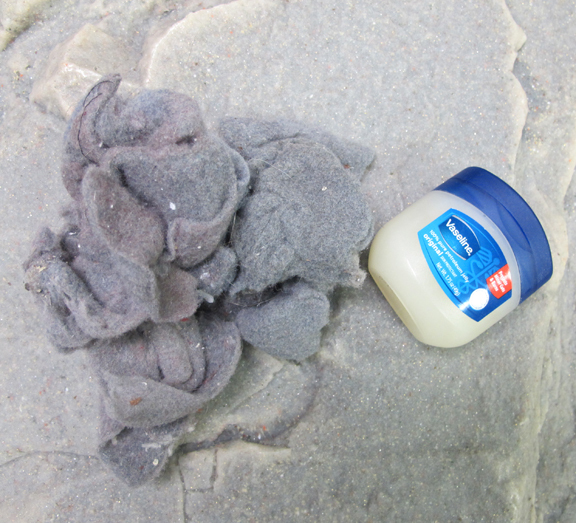 When mixed with dryer lint, petroleum jelly acts as what’s called a FUEL EXTENDER. By this I mean that it allows the flame to burn longer than normal. 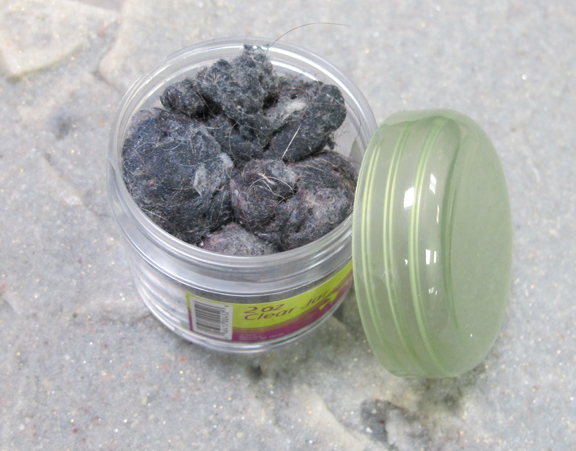 The fibrous dryer lint is what catches the flame and the petroleum jelly acts of a fuel source and allows the flame to burn longer and slower – giving you more time to feed the small flame with little twigs and wood shavings that you have already prepared. Without the EXTENDED burn time, your window of opporunity goes up in a flash of smoke – literally! It’s possible, but more difficult. Petroleum jelly can be a fuel extender for many different materials including cotton balls, cattail down, milkweed down, dried grasses, etc… I always carry a tube of CARMEX Lip balm in my pack for this reason. CARMEX is a petroleum based lip balm and can be mixed with a variety of tinder to make excellent fire starters. Making PET Balls is a very simple process. The first step is to slather a big scoop of petroleum jelly on a descent sized chunk of lint like you see below. 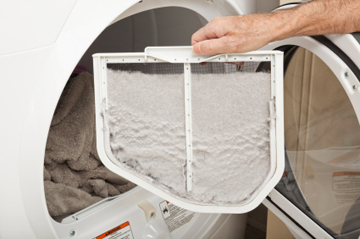 Then, with your hands, vigorously mix the 2 ingredients until the dryer lint is completely saturated. 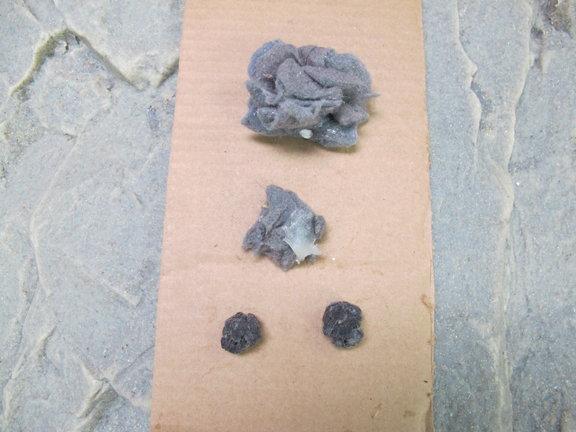 Finally, simply roll the saturated chunks of dryer lint into small quarter sized balls. PET Balls: Finished Balls - Ready for a spark. When you are ready to use them, simply pull them apart to form a small nest – stretching out the fibers a bit. Then, land a spark right in the middle and watch the magic. Choosing a container for your PET Balls is pretty basic. I prefer a waterproof container – even though PET Balls will successfully take a spark even when damp. You can use any small container and jam in as many PET Balls that will fit. There are several good small container options in the SMALL TRAVEL SIZE section at most pharmacy stores. 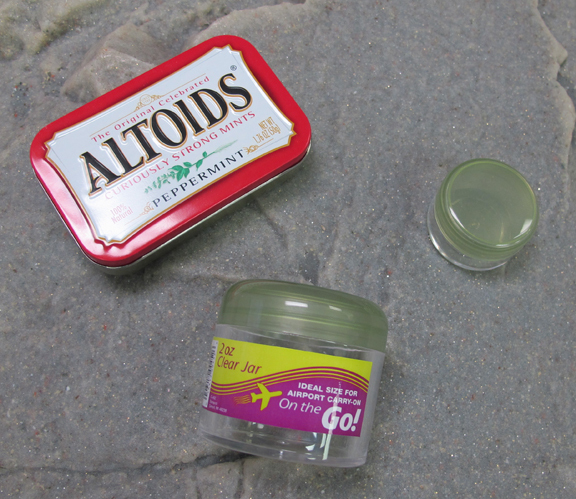 You can also get creative and use containers such as Altoid Tins and old film canisters. Once you choose a container, the more PET Balls you can fit, the better. Jam them is as tight as you can get. If I were using the Altoid Tin below I would cram in at least double that many. It helps to saturate the dryer lint even more. Besides, these little fire-balls weigh virtually nothing and can be life savers in damp & rainy weather conditions. Sure there is excellent fire starting tinder available at camping and outdoor stores. But why spend $10 on something when you can spend virtually $0 and a few minutes to create a product equally as effective. This is exactly what being a survivor is all about – using the resources at hand to meet your basic survival needs – in this case, FIRE. A BIG lesson from a very simple project. Hope you found this post useful. Comment below and tell me and other readers what has worked for you! I add one last step.. I roll the balls in on layer of toilet paper. They store better (they are not sticky), plus the TP burns well and you don’t get Petroleum Jelly on your hands in the field. Great article Creek. Thank you. As Joemomma said, it is a good idea to wrap the balls in something. I utilize a used dryer sheet which happens to burn too. Keep up the good work. I love the dual use of Carmex. It is also a makeshift lubricant and salve. I really like your site. I’m a fellow Hoosier…grew up in Bluffton, about an hour north of Anderson. My favorite version of these is using cotton balls rolled in petroleum jelly–though you could use dryer lint as well–stuffed into a plastic straw, like what you’d get from a fast food restaurant. Simply melt one end with a candle or lighter, crimp it with pliers, stuff the straw full of PET balls, then melt and crimp the other end. 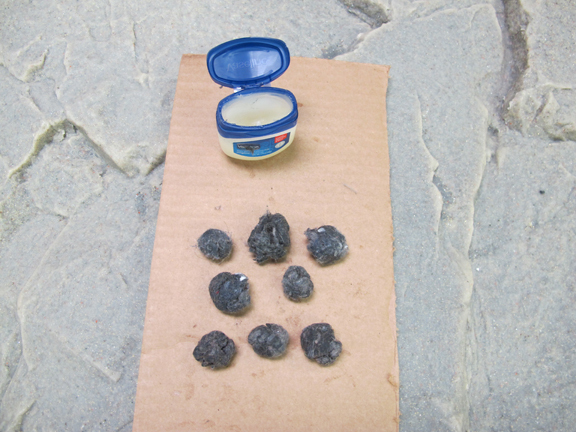 The advantage is it seals the fire starters off from moisture, as well as making them less messy to store; that petroleum jelly gets everywhere! When you need to use them, slit them open with the tip of your knife, fluff them up, and ignite them. If you search for “fire straws” on youtube, there are instructional videos. Here’s one that shows some firestraws ranger banded to a knife sheath along with a ferro rod. Like some other people here, I like to try to package my firestarter in a less messy way. I like to use cottom make up removal pads. You can tear them in half horizontally, fill the middle with petroleum jelly, and put them back together like a sandwich. When you are ready to use, you simply pull it apart, put one sticky side to one dry side, and light with the remaining dry side down. Using a tuna can as a hobo stove, you can bring 250ml of water to a boil with just one. How long do these last? If I make a bunch now, would they last 'til spring/summer? or would I have to make them fresh? I believe these should last well past your lifetime. It’s not like the petroleum jelly is going to spoil and with the drier lint being saturated in the jelly, the are not going to break down soon. How long do these keep? If I made a bunch now, would they keep ’til spring/summer or would I have to make them fresh? I’ve never seen them expire. To my knowledge they will last forever. Just a thought, if you have small children, you may have issues with the lint catching a spark because a lot of kids’ clothes are treated with a flame retardant. It took me quite a while to figure out why I couldn’t get a spark to take in my firestarters! I am a kid, I'm on this site cause my dad wants me to do something with all the dryer lint we have sitting around. I have been trying to get vaseline for the past 3 weeks and finally got a chance last night! I'm planning on making them tomorrow, looking around for storage ideas. I am a kid, I’m on this site cause my dad wants me to do something with all the dryer lint we have sitting around. I have been trying to get vaseline for the past 3 weeks and finally got a chance last night!I’m planning on making them tomorrow, looking around for storage ideas. Thank you! This was very informative! for use at home in building fires… stuff this stuff inside the empty cardboard rolls from TP etc. they are great like this too. Great tip…If folks would just do this simple stuff in preparation for disasters. Jerry… so right… I grew up with parents who truly believed and lived the "use it up, make it do, or do without" way of life. When I lived in a house without the fireplace I tried many, many things to do with TP rolls. LOVE living in a house with a working fire place now. I guess if we live our lives more simply the ‘disasters’ wouldn’t feel so much like a disaster. We made similar firestarters for camping: stuff dyer lint into a cardboard egg carton cup, then pour melted paraffin into and over it. Let cool/harden. The edges of the egg cup acted as the wick and these burned a *wicked* long time! We started more than one fire in the rain with these! who knew? also 7 ways a tampon can save your life ;). even must use the fax machine to transact with customers. This is a great tip! I put my first batch in some old prescription pill bottles, but some of the petroleum jelly leaked out of it over time. It's a good thing that I had stored those bottles inside of a sealed plastic bag. I found for myself that plastic "Skippy" peanut butter jars make a better container for this fire starting material, as they don't leak. They are also available in a variety of sizes, which is good because you may want to carry a small or large amount of the material with you on your excursions. To keep my kit ultralight, I stuff the pet/lint in small sections of drinking straws. Seal the ends with a lighter (holding shut with needlenose pliers) and they are waterproof. Cut open, pull some of the lint out and fluff it up to catch the spark.